SOLD OUT FOR THE 2018 HOLIDAY SEASON! Santa, Snowman and Christmas Tree Shaped Lollipops starting at 50% Profit! You Make $160.00 Profit / Case with No Shipping Charges! 3. Your price for one case of Lollipops is only $160.00. 4. You make $160.00 per case. That's 50% PROFIT! Sugar, Corn Syrup, Natural and Artificial Flavors, Artificial Color (Titanium Dioxide). Depending on the flavor, it may contain: Citric Acid, Malic Acid. Colorants also dependent on the flavor, it may contain any or all: Red 40, Yellow 5, Blue 1. 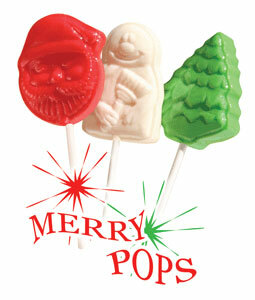 Merry pops are free of nuts and Allergen Free.